The artist Willie Birch grew up in New Orleans before the passage of the 1964 Civil Rights Act, well before the Black Power Movement, and in the throes of the Jim Crow South. The year was 1960, and the prodigious Birch had just graduated from Booker T. Washington High School, while little Ruby Bridges was on the other side of town integrating New Orleans public schools in the city’s 9th ward. There was a glimmer of hope for a new trajectory for black New Orleans. Commonly, at that time, African American students were forced to choose between the classroom and working a job to help the family make ends meet. Birch picked education. He also chose freedom. Willie Birch, “Waiting for a Serious Conversation on the History of the South,” 2017 Acrylic and charcoal on paper 72 x 75 in. Birch would go on to become a nationally acclaimed artist and to have his works in collections the likes of The Metropolitan Museum of Art in New York City, Universal Pictures, Ogden Museum of Southern Art, and New Orleans Museum of Art. Changing Course is about the people. The comprehensive exhibition consists of a series of projects, as NOMA was insistent on including the voices from New Orleans’ most vulnerable communities. For instance, the short film by The Propeller Group, “Night of the Living Dead” connects Vietnam and New Orleans in a documentary aligning the cultural traditions of funerals, celebrations, and rituals. Then there are, perhaps the most defenseless voice, the school children, poignantly captured by on-the-move photographer L. Kasimu Harris. The moving image of kids traveling to school, before sunrise, and after sunset as a result of the post-Katrina school charter scramble. It brings to the realization how this marginalized community is, to some, just pawns in a game of enterprise. The other participating artist and groups are Katrina Andry, Lesley Dill, The Everday Projects, and Skylar Fein who’s installation, “Remember the Upstairs Lounge,” commemorates the 1973 arson at the then-popular French Quarter gay bar. 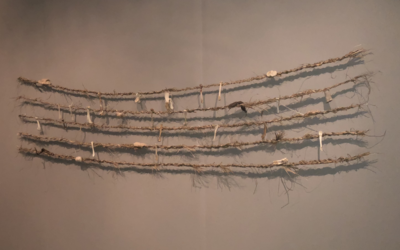 Birch’s diverse installation that includes new mixed media pieces of braided sweet grass and bones, and his older works of paper maché, and charcoals, anchors the exhibition. At first entrance to the main gallery, you see Birch’s black and white, grisaille-like images for which he has become known. 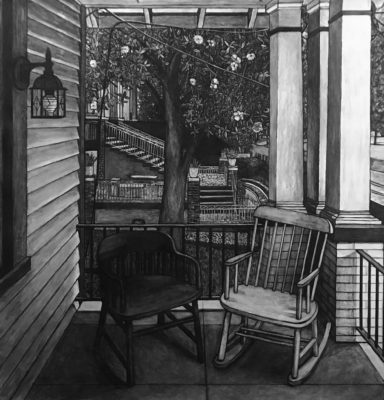 The images are of everyday occurrences in the South and around New Orleans, like the piece with a woman standing with a sun hat before a shotgun house, or the piece showing telephone lines hovering above houses in a town below sea-level, or the piece of the porch with the two empty chairs, titled “Waiting for a Serious Conversation on the History of the South.” In this context and concept, the artist is depicting who we are and where we are headed. For Birch, he looks at the past only to reflect on the present and believes that in a post-Conceptual New Orleans that jazz is a concept to be built upon. 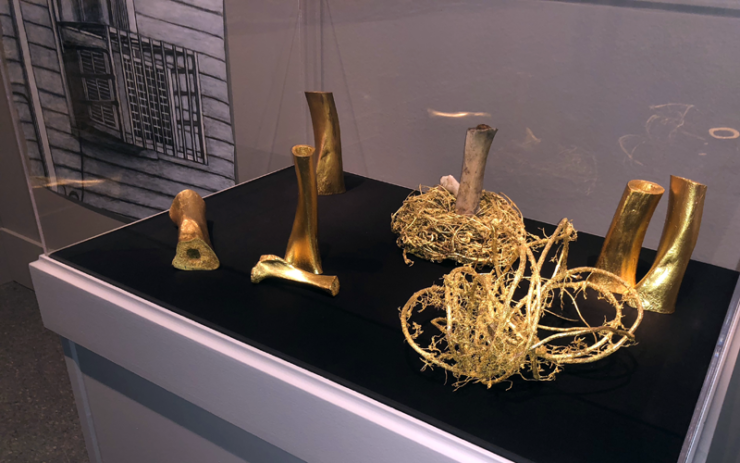 Admittedly, his installation for Changing Course is a “riff on jazz,” which is apparent in the mixed media piece titled, “Five Lines, Four Spaces.” Like a music stanza, these are the same fractals seen in the eponymously titled piece. 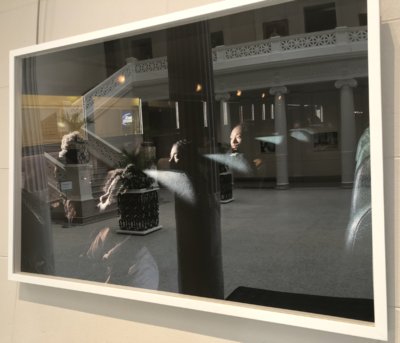 Changing Course: Reflections on New Orleans Histories is on display at New Orleans Museum of Art until September 16, 2018. Willie Birch will be present for an artist talk on August 31, 2018 at 5:30 pm.